Autographs. I value them, yet I can't be bothered to acquire them. Does that make sense? It does to me. Let's see if I can explain. I do enjoy an autographed card. 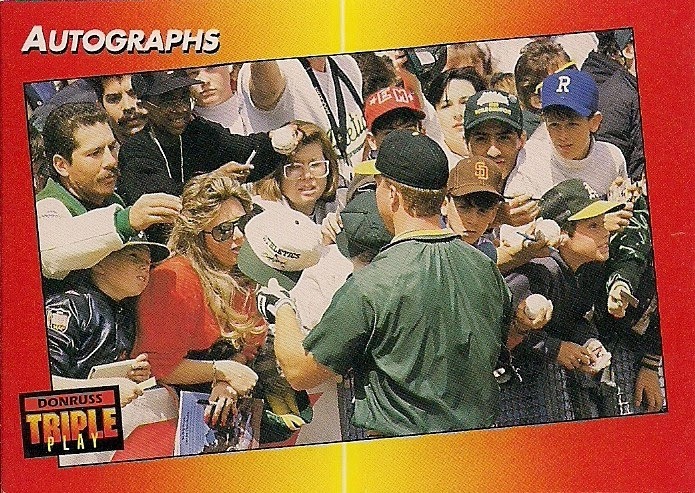 I like the idea that a major league player spent a couple of seconds to sign a baseball card that I own. I feel a connection to the player -- no matter how slight -- because he signed my card. But I view those cards almost as an "extra" in my collection. They aren't the reason why I collect. Autographed cards are almost like the gimmick in my collection. 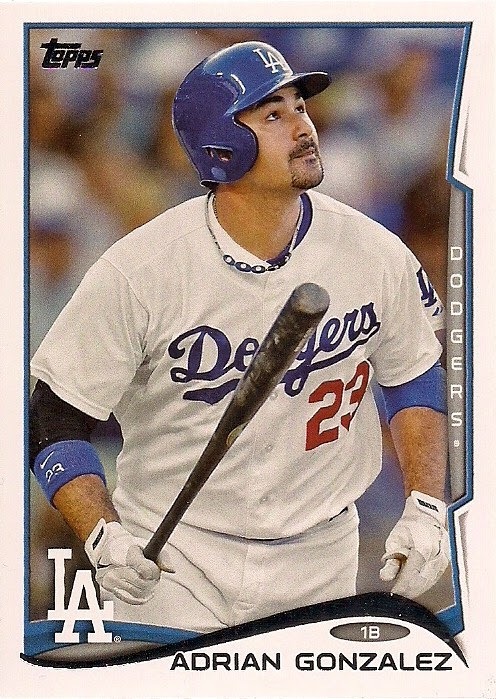 If I were to give someone a tour through my cards, I'd go through all of my sets and then all of my Dodgers and then -- oh, yeah, here are some flashy autographs of some guys I keep on the side. No doubt that unnamed tourist would be especially interested in the autographs -- far more interested than in whatever sets I completed. 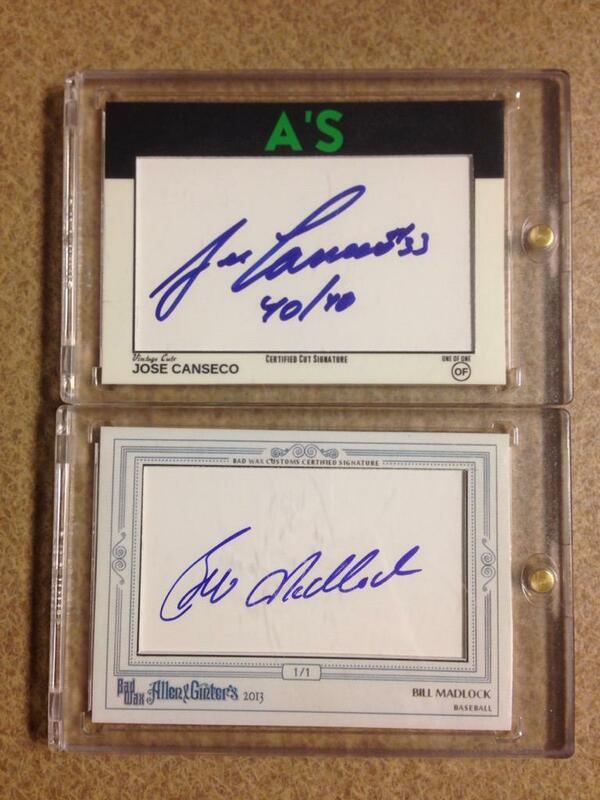 Autographed cards speak to the memorabilia collector, and to people who don't even collect. A signature almost validates the hobby for them. But me? I can take autographed cards or leave them. 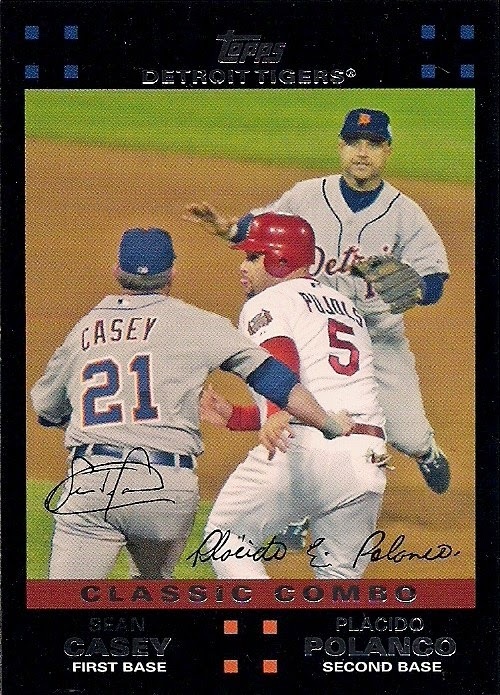 In the early years of this blog, I collected some autographed cards through the mail. They are the autographed cards that I value the most, because the player was important to me and they took the time to respond to my request. But I don't do that anymore. I decided that it was not where my collecting interests lie. 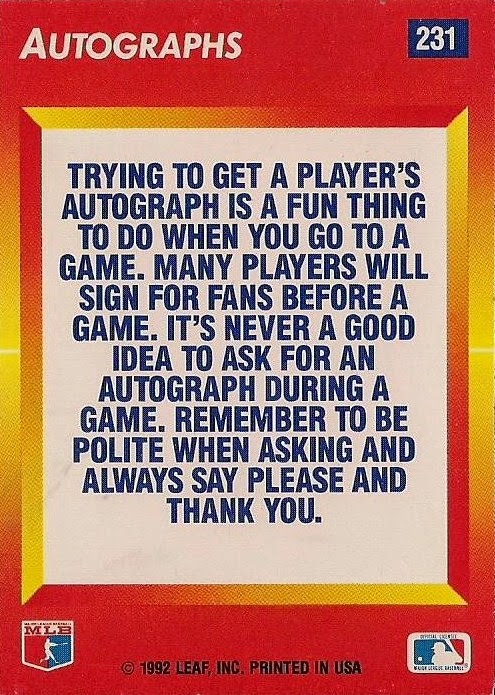 As for flagging a player down at a ballpark or standing in line at a memorabilia show? Sorry, there is nothing in my personality that would allow me to do that. Not even when I was younger. 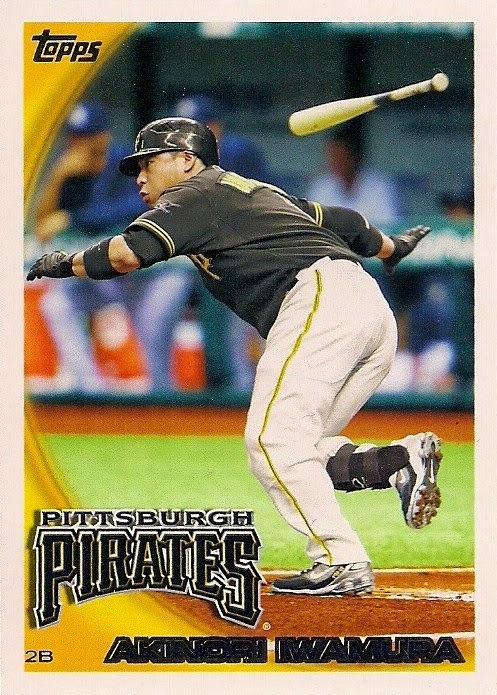 Aside from all of the line-standing and pleading, what would happen if someone snapped a photo of me doing that and then placed it on a mass-produced baseball card? What do those folks on the card above think 22 years later of how they looked? It must be like viewing your old family photographs. Except a whole bunch of strangers can see them, too. These are the chances you take asking for autographs. It's officially Christmas season, I suppose. But I'm not black Friday shopping nor taking advantage of any online black Friday baseball card deals. You have to have money to do those things. So, what am I doing instead? 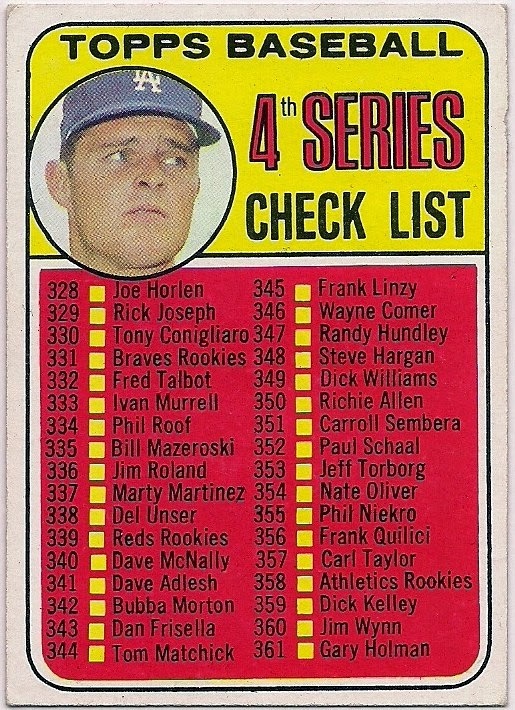 If you're a team collector, one of the more annoying facets of 1960s cards are the checklists. Between 1967 and 1969, Topps printed a head shot with its checklist cards. That head shot was a star of the period and there was a different star player on each checklist card. 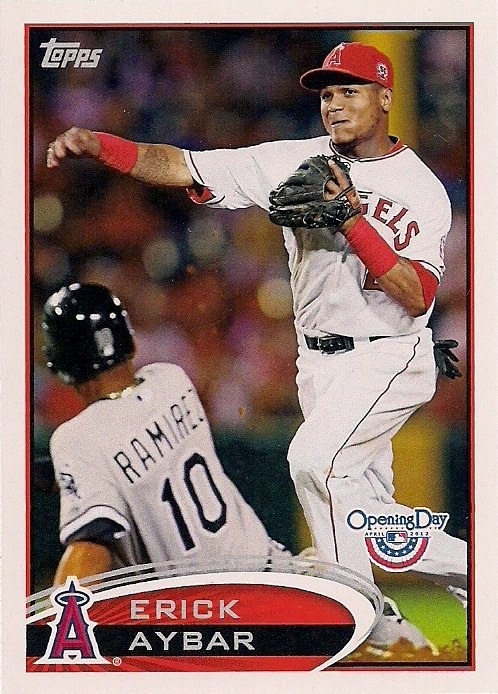 The player is unnamed on the card, which often causes it to slip under the radar for team collectors. 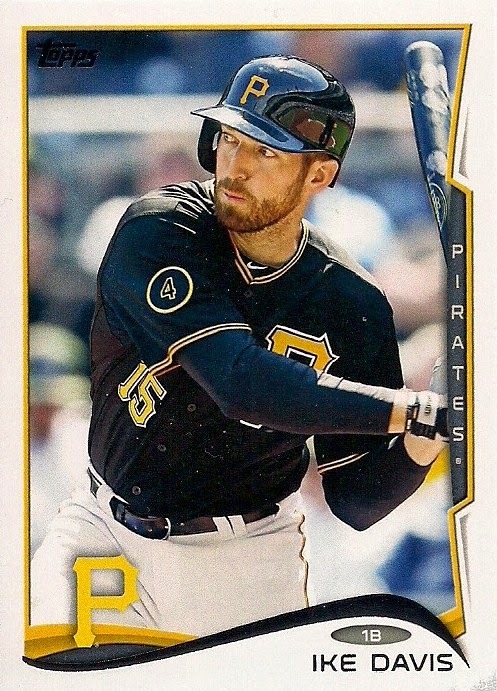 Some checklist guides don't even bother to mention the player pictured on the card. It merely says something like "4th series checklist". So this is what happened with the above 1969 Topps 4th Series checklist, which pictures Don Drysdale. 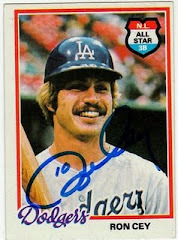 Long after I thought I had completed my 1969 Topps Dodgers team set, I discovered that this card existed. Wow, was there ever a lot of cursing after that discovery. I think the neighbors are still talking about it. One side benefit of those cards is that you can pick up a card of a superstar that ordinarily would be out of my price range. This 1969 checklist is the only vintage Mickey Mantle card that I own and it was easily acquired. It doesn't hurt that it's off-center. 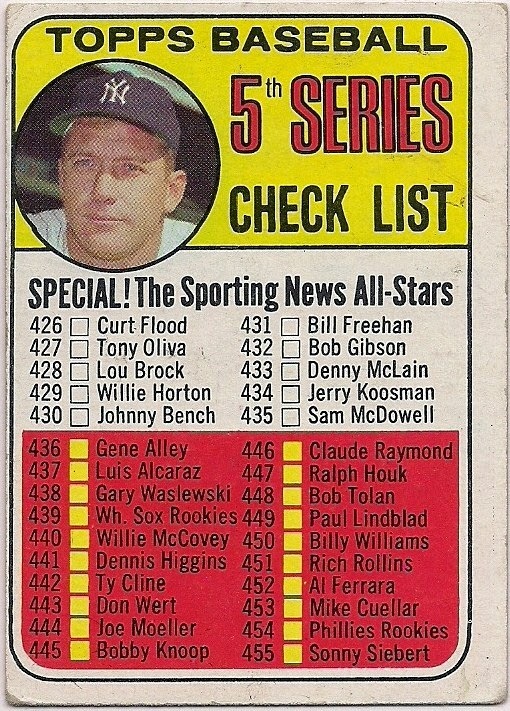 But after 1969, Topps returned to checklists without photos as they had done in most of the previous years (with the exception of 1961, which features action photos). This was the world in which I entered collecting. 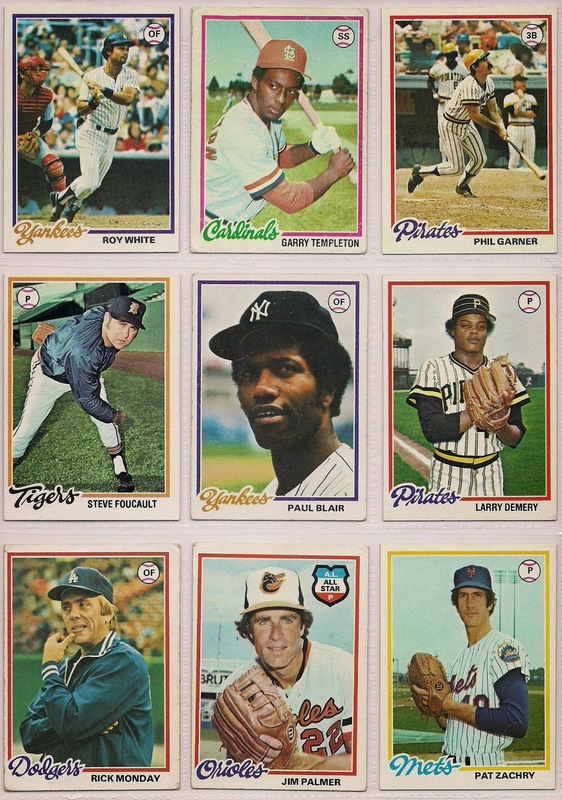 Most 1970s Topps checklists feature no photo, not even a drawing of a player. It's probably why I was so surprised when I discovered photos on checklists. 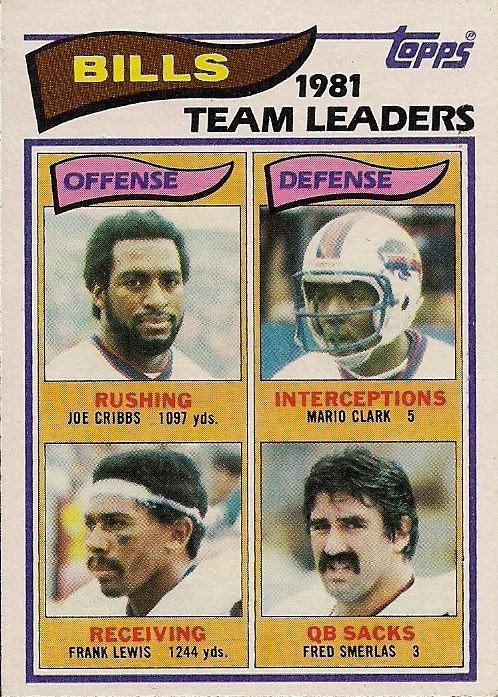 Through the '70s and '80s, checklists continued in the same pattern until, I think, 1984 Fleer, which broke its checklists down by team and featured a picture of the team's manager in an inset photo. There were several other checklists that followed in the early '90s that featured action photos on its checklists. I pretty much ignored those and still don't know if there is a Dodger on, say, one of the 1993 Donruss checklists. I really don't care. I think I squealed like my daughter when she was 5 and saw a spider in the back seat. What the hell is this? It was like 1969 all over again. I was both thrilled and horrified. 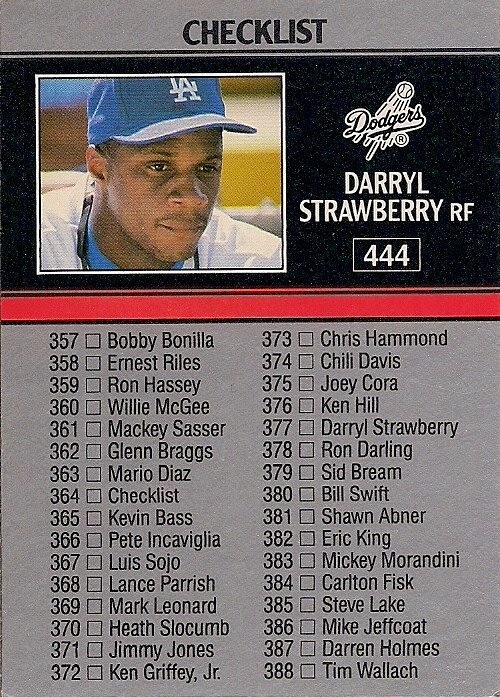 Thrilled because I finally owned the 1991 Leaf checklist card with Darryl Strawberry on the front but horrified because I never knew it existed, that it was laughing at me for two decades, and HOW MANY MORE OF THESE THINGS ARE THERE???? So, I decided to investigate this in the most half-assed way possible. 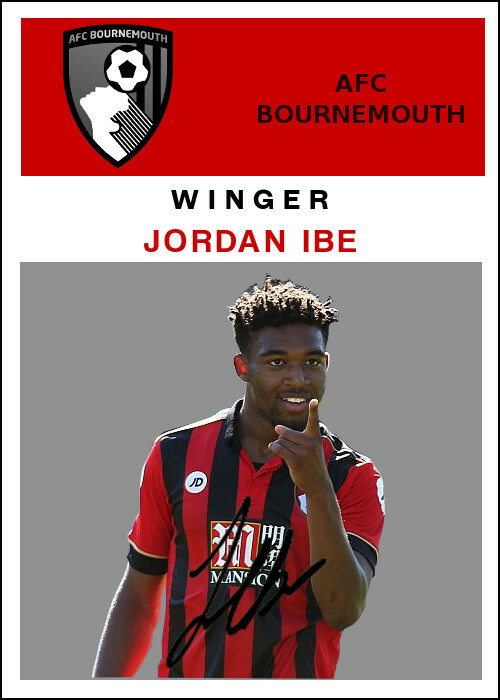 I'm sure a lot of checklist sources mention the players on each of these checklist cards, but how about getting them together all in one place? This is the one place. Phew! No other unknown Dodgers. Hopefully no one else freaked out when they spotted a player from their favorite team on a checklist like I've done. But a bit of friendly advice: check your checklists twice. I don't know about you, but for me November has been a weird month, both on the blog and elsewhere. For one, readership always goes down in November. Always. It's been that way since I first figured out you could calculate such things. I don't know why that is. The weather is almost always crap in November, you'd think people would focus on more sedentary activities. Second, a lot of people either stop talking about or paying attention to baseball cards in November, which might be the answer to the paragraph above. 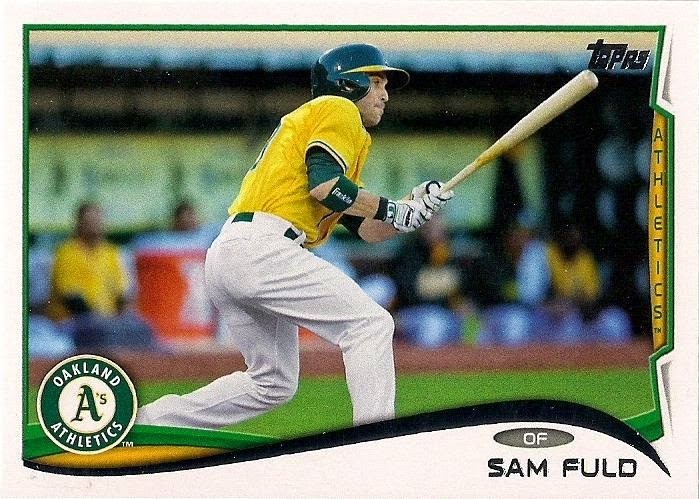 I'm a baseball guy, so I'll never stop talking about baseball cards just because the season's over. But I guess some people do. Third, I'm broke in November. Well, I'm broke a lot of other months out of the year these days, but no money in November has been a constant for the last six years. Finally, it gets odd for people in November. I don't know if people sense they're getting to the end of the year and they assess their lives and aren't happy with the results, but whatever it is, I sense it. People need to relax. I say all of this because for me, things are moving along surprisingly smoothly this month. I've kind of struggled throughout the year with blog topics, and I still feel like I'm operating without a net, but I'm having no difficulty writing this month. Stuff is just coming to mind and I'm happy to write it (having both happen at the same time is very key). And here's another place where the blog is operating smoothly: I'm officially caught up in featuring trade packages. OK, so a lot of that has to do with the fact that I don't have any money to send out cards, so there's none coming in either. But I'll ignore that so I can show you these ones and act like I'm buried in yellow envelopes. All of these came from plain white envelopes actually. As the price of mailings has gone up, I'm getting more and more of these (and sending more and more out). This card and the next two are from Ryan of "O" No!!! 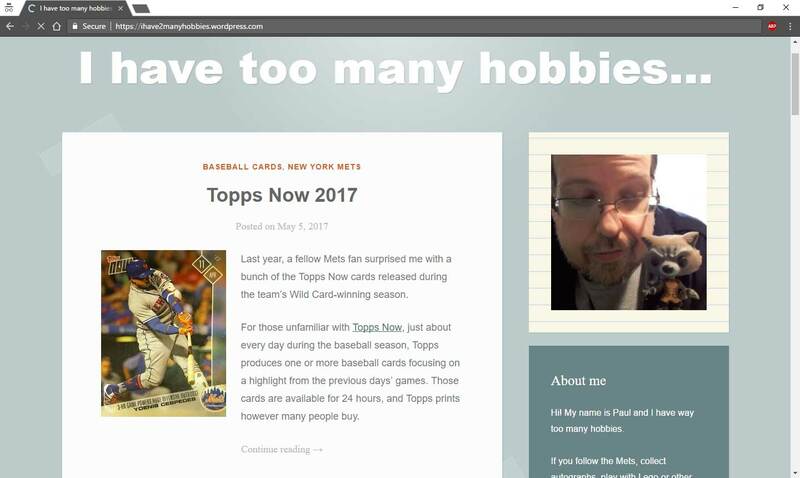 Another Orioles Blog. He found time to send me these while keeping his card storage area in immaculately organized shape. If my cards were organized so expertly, there's no way I'd be blogging. I'd have no time. 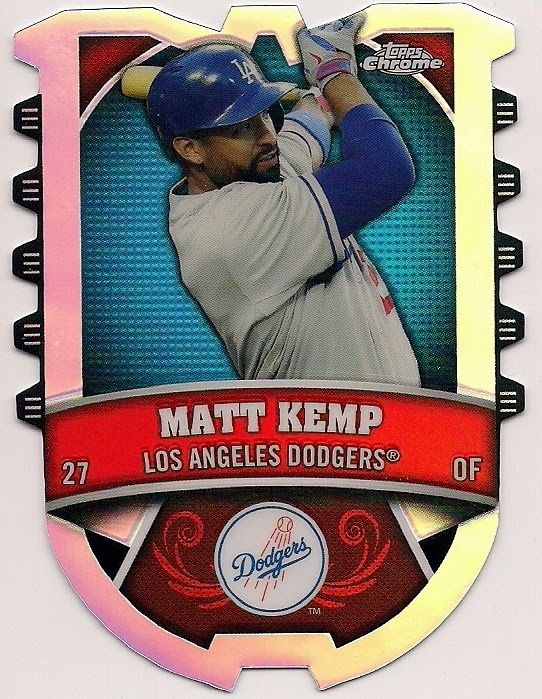 The other two cards are Matt Kemps. 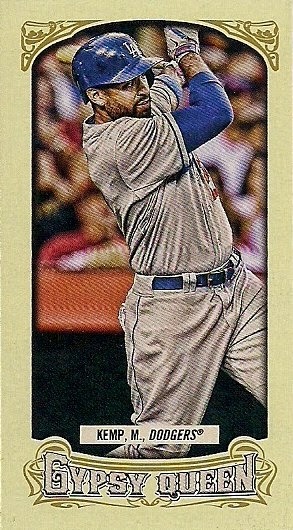 This is a mini from this year's Gypsy Queen. I have nothing else to say about it except that I really wish GQ would just give up. Isn't that wild? 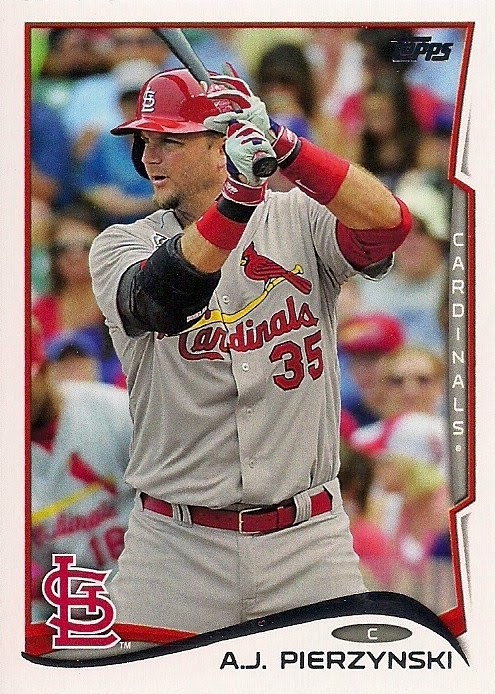 This diecut from Topps Chrome is so crazy that it took me several days to notice that the picture is the exact same one from the Gypsy Queen card (one of the most irritating things that Topps does these days). 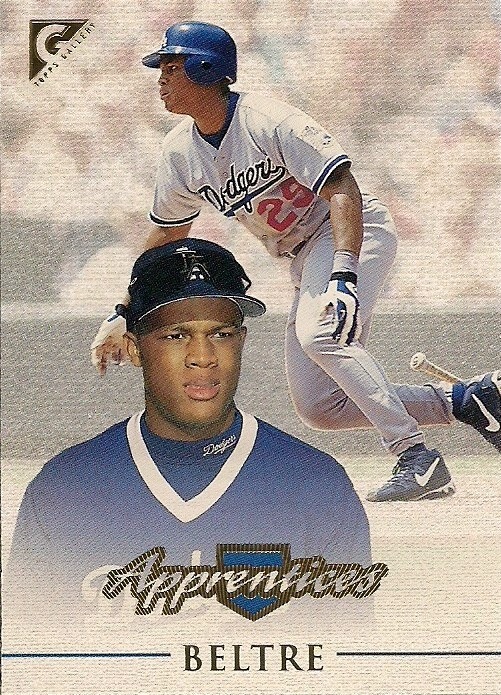 This 1999 Topps Gallery card of Adrian Beltre arrived from Paul of Paul's Random Stuff. He sent me two Beltres in a PWE just because. This one I needed, and the other one I had. I'd show that one here, too, but it's foil board and they haven't found a scanner that can present those in a manner worth looking at, so let's skip it. If you have a dust fetish, I can send you a scan via email. These Bills cards arrived from Jeff at One Man's Junk (Wax). He wanted to know if I had an interest in any early '80s Bills cards. I pretty much ignored football completely during my high school years, so early '80s Bills don't mean much to me, but I do know the names. 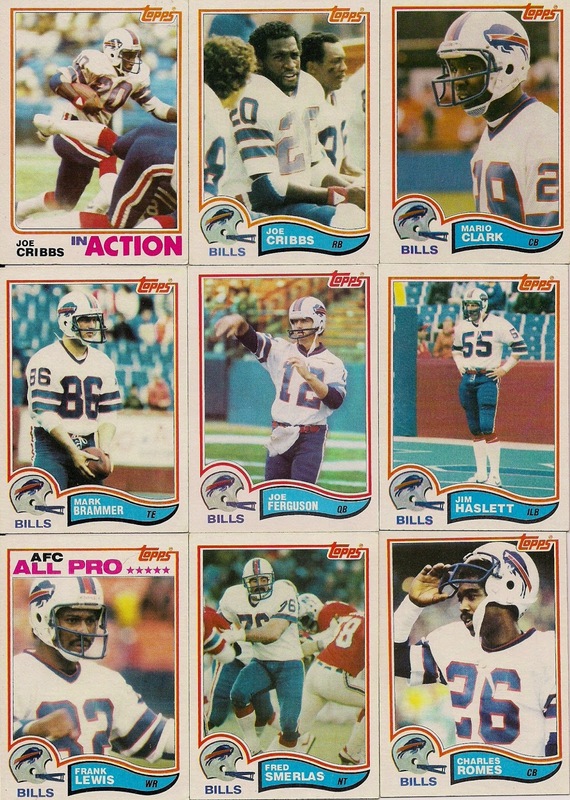 And with these 1982 Topps Bills, I realize that all that 1983 Topps baseball is is the child of 1963 Topps baseball and 1982 Topps football. I'm disappointed. It's kind of like knowing how the sausage is made. 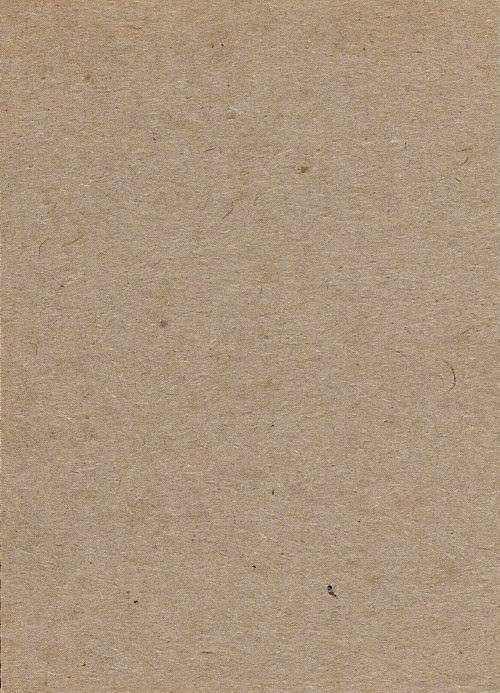 I saved this card for last because it's such a charming one-card package. It arrived unexpectedly from Judson of My Cardboard Habit. He said he pulled it out of Topps Update. Of course, it's a buy back (the 75th anniversary stamp refers to Topps starting its cardboard machine back in 1939) and it's a card I already have in non-buyback form. But the combination of the stamp with the fact that it's Reggie Smith makes it pretty damn cool to me in a way that I can't figure out. I don't know, I guess I'm just in a surprisingly good mood this November. Now, if only some of the November sourpusses would join me. 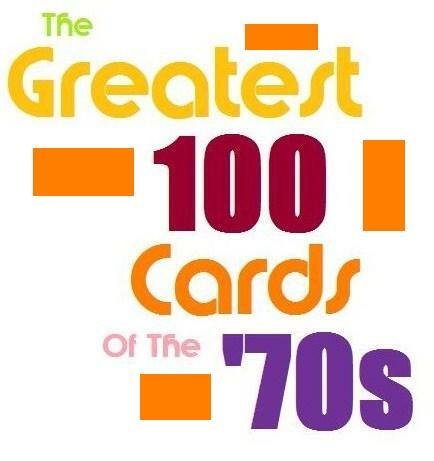 OK, 1970s fans, tell me what these nine cards have in common. If you collected in the '70s, this should be easy. 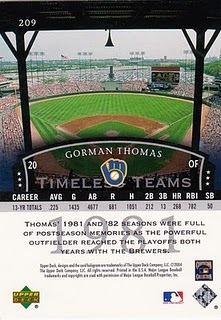 The answer is every one of these cards features a home run in the game that you could play on the back of the card! 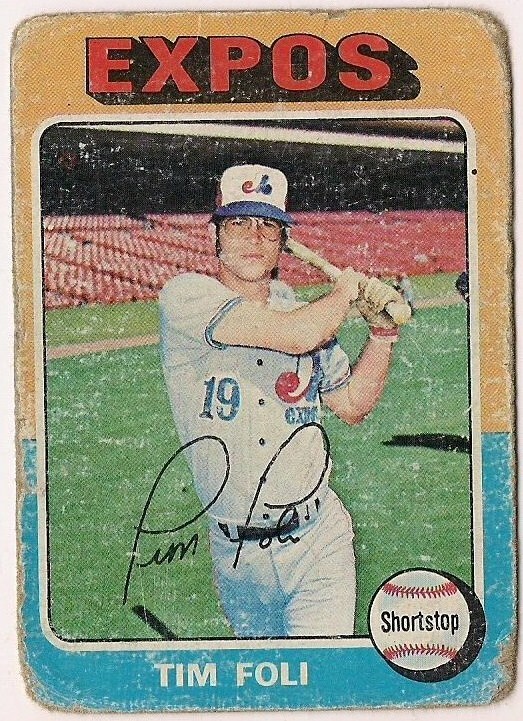 For those who never came across a card from 1978 Topps, it featured a game on the back called "Play Ball". 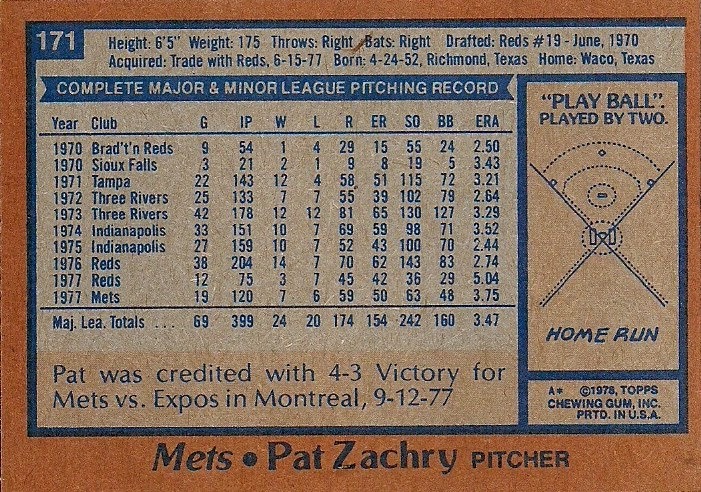 Each player's card displayed a particular baseball play on the back: single, double, triple, strikeout, fly out, ground out, etc. We played this game many times in 1978 and I even played it once on the blog to answer the nagging question of what would the score be if you played a full nine-inning game from the beginning of the set? But as I mentioned in that post, there were many other questions that I had regarding the game. 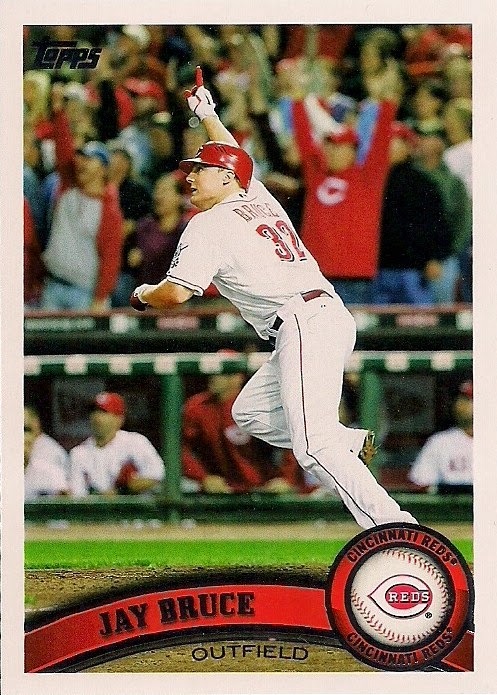 For instance, those cards above aren't the only cards with home runs on the back. But how many were in the set? Well, now I know. Because I counted them. Which teams have the most? I know that, too. 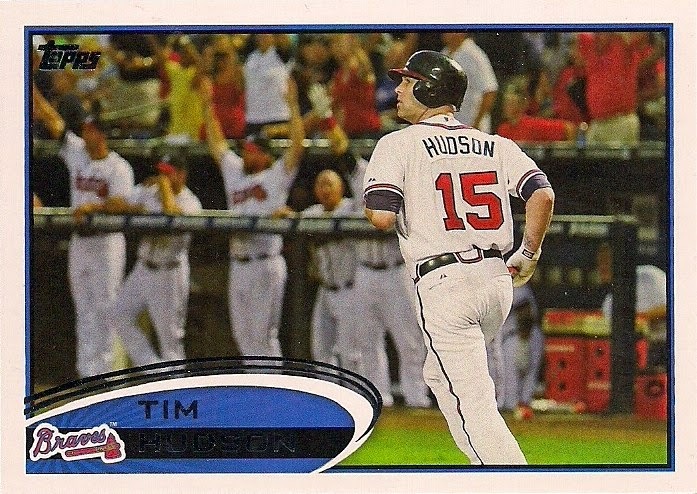 The Indians, Phillies and Angels each have three cards with home runs featured on the back. The Braves, Cubs and A's have no cards with a home run on the back. When we were playing this game as kids we were convinced that there were far more doubles then there should be. So I counted the doubles, too. There are 28. I don't know if that's a lot or not. I suppose I could count all the singles now to compare. There are 130 cards with singles. I think. I probably counted that wrong. But at least there are a lot more of those than doubles. The other thing I was curious about was which team had the most productive cards in the game. 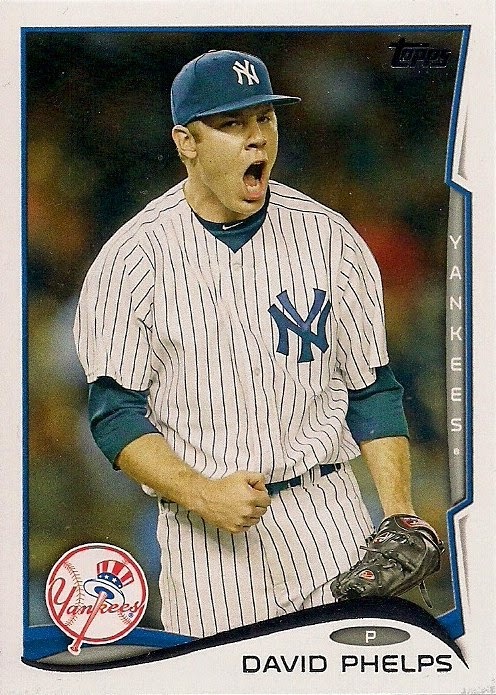 My suspicion was the Yankees, since every time I turned over one of those cards it seemed to have an extra-base hit. But I didn't know for sure. I wanted to know for sure. Fortunately, a blog is the perfect thing for such a task. I went through every team in the '78 set and played the game with each team to determine how many runs each team would score. I played it like we played it when I was a kid. A single counted one base, a double two. No assuming someone could advance from first to third on a single. No assuming double plays or sacrifice flies. Three outs and that ended the rally. Every team scored at least two runs. 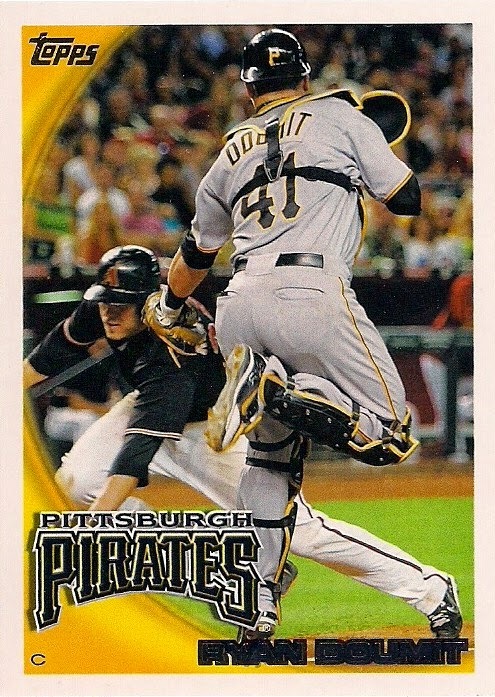 There were some other things I came across when I was doing this, like the number of grand slams that occurred (5), and the fact that the Pirates took the longest to reach three outs (card #383 - Mario Mendoza, go figure - was the third out). But I think I've nerded out on this game for long enough. All of the nagging questions that have lingered since 1978 have been answered. It may not seem like I have a life after all of that, but I promise you that I do. 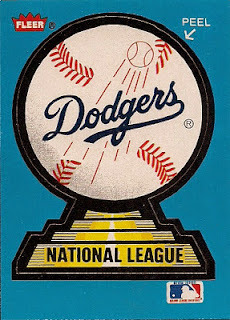 A significant part of the charm of night cards from the mid-1980s and earlier is that there simply aren't many of them. Every night card from back then was and is a discovery. It's why I gravitated to them in the first place. While collecting them as a youngster, they stood out as a novelty. And through my love for everything dark and neon, a collection was born. 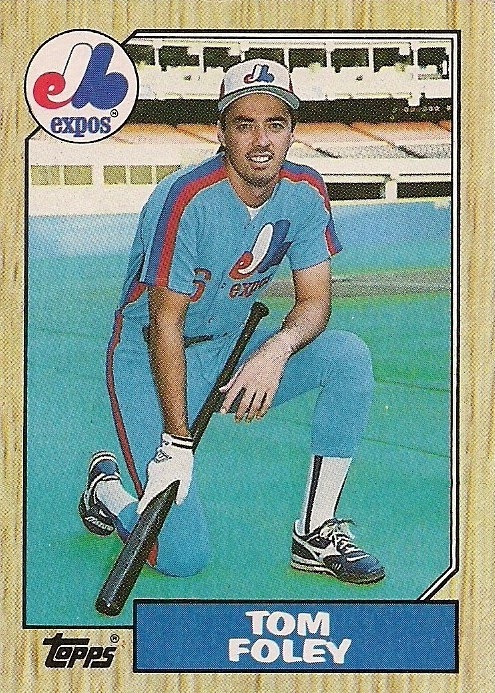 For instance, this 1984 Topps Traded card of Tim Stoddard is one of the few night cards in all of '84 Topps. There are just a handful. Andre Robertson and Rick Cerone from the flagship set spring to mind. There can't be many more than that. But today? You can't turn around without falling over a night card in a current set. Return to home plate celebrations? Check. Return to the dugout celebrations? Check. Plays at the plate? Check. Mob scenes at the mound? Check. love the ladies chilling at top left. 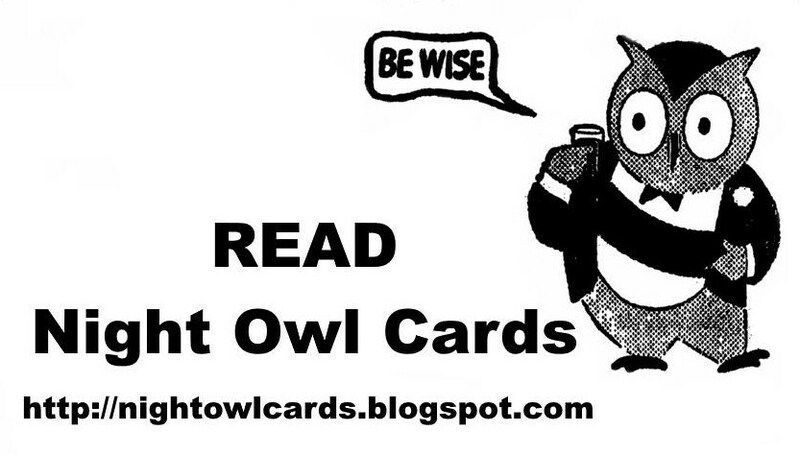 There are also plenty of night cards for all the other occasions that I didn't mention. 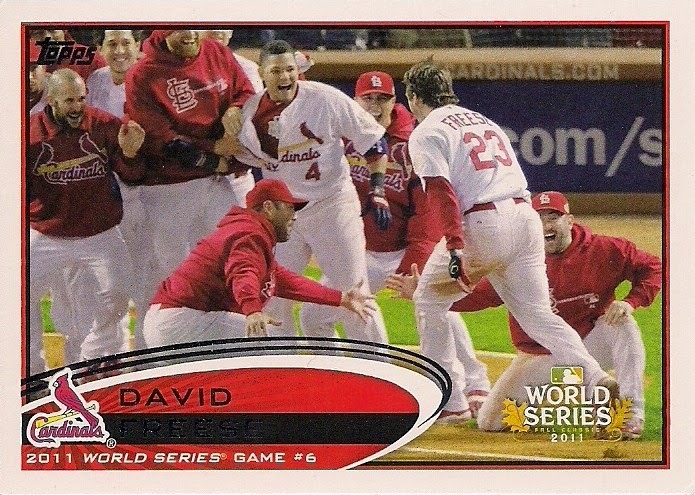 In some ways, it's sad, because the novelty aspect of the night card is gone. It makes them a little less special. But at the same time, you can fill up a binder full of them a lot more quickly. So let's fill that binder up some more. Does it make the binder? : No. (Need it for the set). Does it make the binder? : It's already in as a previous ANC topic. Does it make the binder? : No. 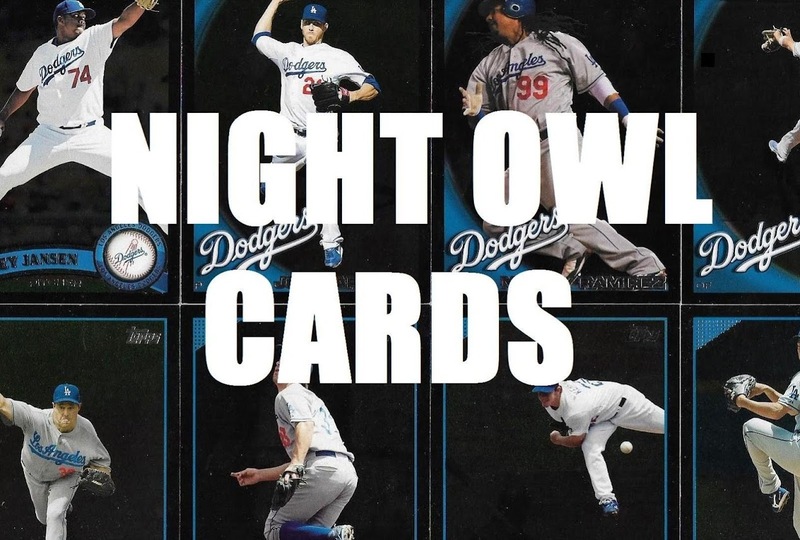 It can't top this double-sided night card. Does it make the binder? : Yes. Does it make the binder? : Nope. 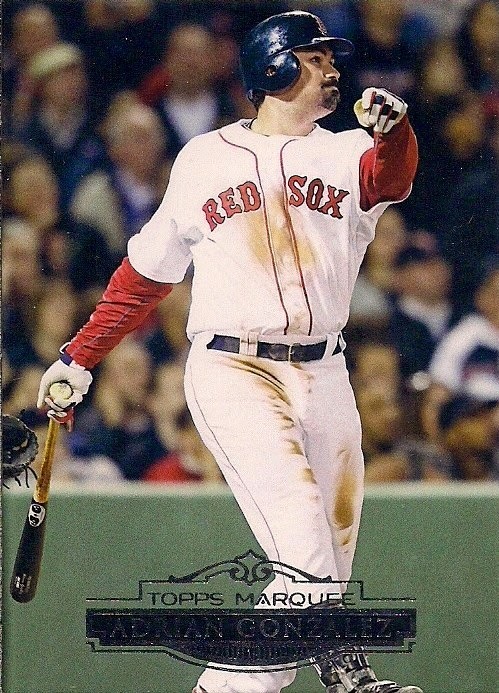 Pokey Reese's Heritage card from 2002 is too cool. 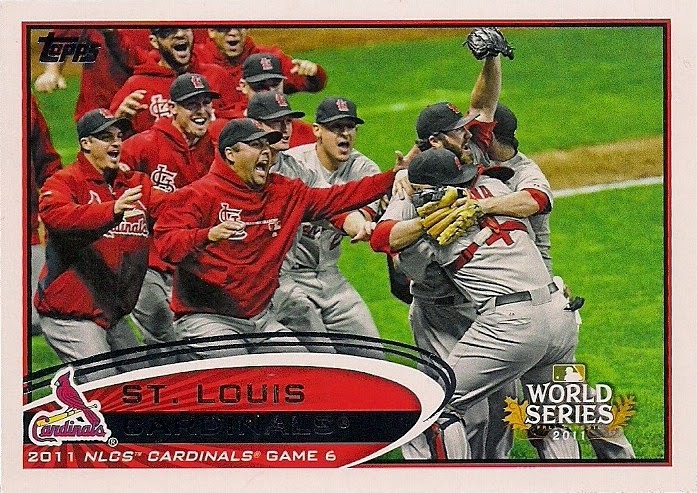 Well, I got nine more entries into the night card binder. Commonplace has its advantages. 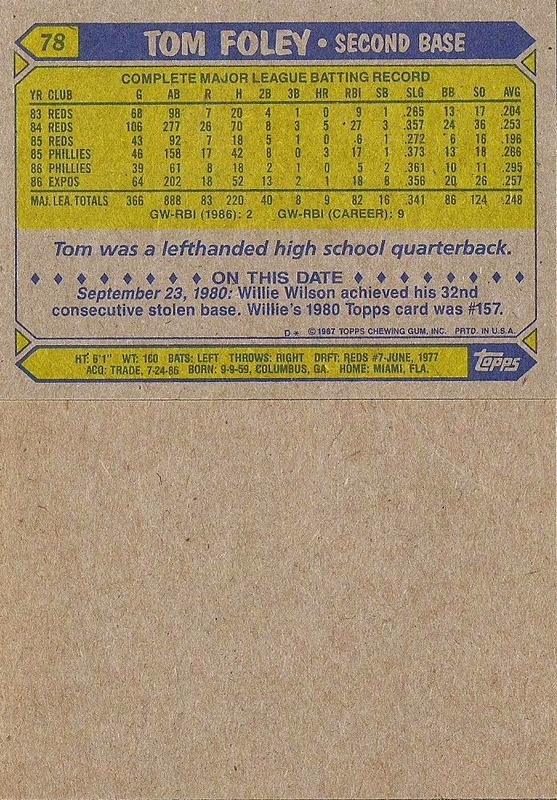 The first time I ever saw a blank-backed card -- that is, one that wasn't supposed to have a blank back -- was in 1987. I was buying rack packs of '87 Topps here and there, usually after classes, driving off campus and on my way to my grandmother's. It was then that I pulled a blank-backed card of Tom Nieto. Instead of saying "who the hell is this? ", because after all it was Tom Nieto, I said "what the hell is?" because the back was blank. I didn't like it. I was deprived of the stats and factoids that make a card complete. It was especially important because I had no idea who Tom Nieto was and I wanted to learn. I had half a card here! I was promised a FULL card! Later -- and I can't remember if it was in the same rack pack or in a different one -- I pulled another blank back. It was another Montreal Expo named Tom. 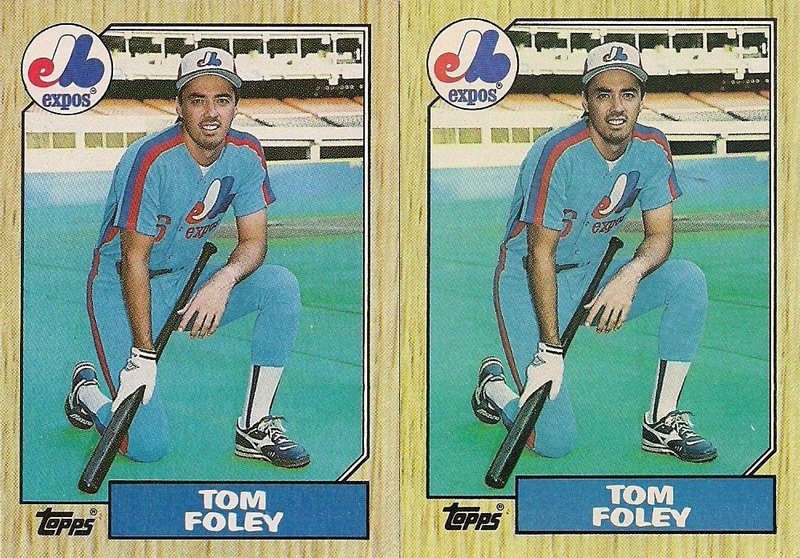 Tom Foley was half a card. I was flustered. For years, I wanted to pull another '87 Tom Nieto and Tom Foley so I could have a complete version of each of their cards. Of course, I wasn't so obsessed that I had to track one down. 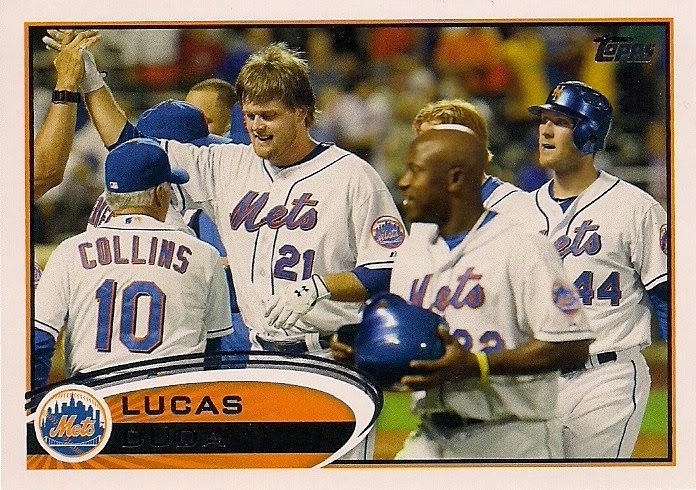 But when I finally did pull a second Tom Foley out of a repack years and years later, I celebrated. Those are the two '87 Tom Foleys in my collection. One is blank and one has all of the usual goodies. 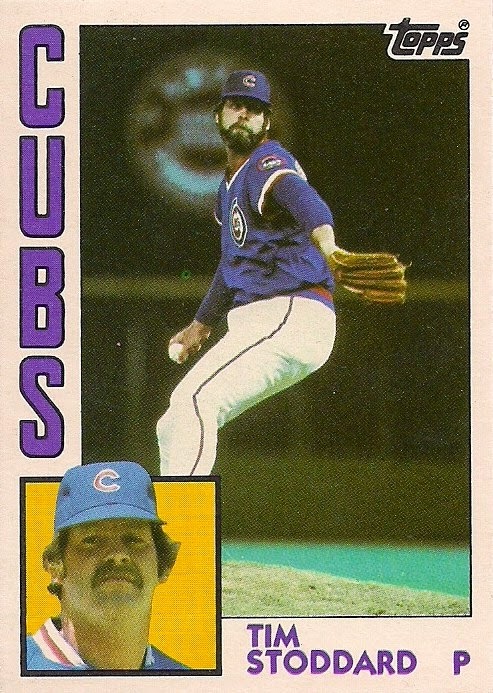 I went all that time without knowing that Foley threw left-handed as a quarterback in high school, yet was a right-handed second baseman in the majors. 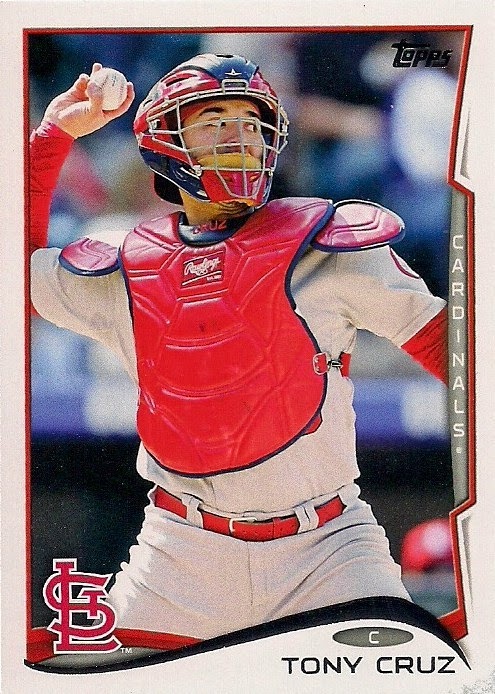 I've yet to acquire a complete '87 Tom Nieto card (or even bother to buy one for the 10 cents it might cost me) and so I still don't know much about him. But in that time, blank backs have become more of an interest than a nuisance. The blank-back Foley card, which may have been discarded if I found a complete-backed Foley card back in '87, now sits next to the regular Foley with the rest of my '87s. Blank backs, as you know, have been around for a long time. The '87 set seemed particularly plagued by them. 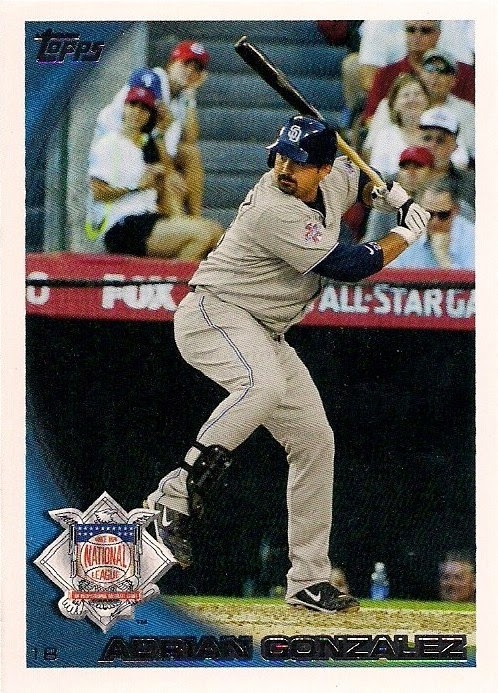 Often they are nothing more than a printing error that escapes into packs. 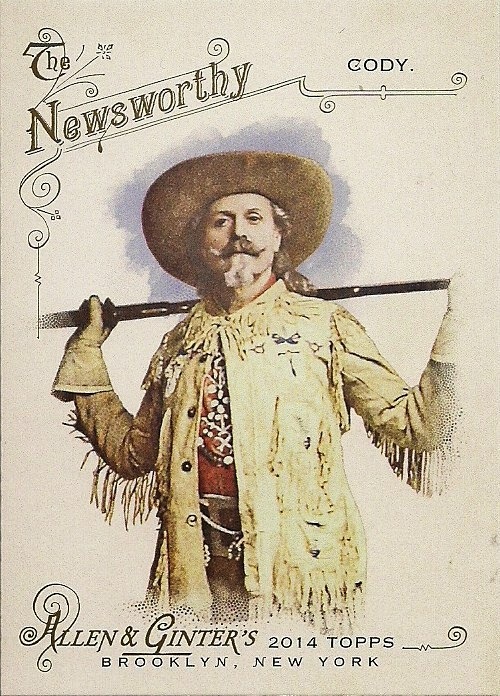 Less frequently (and more expensively), they are proof cards and coveted by some collectors. 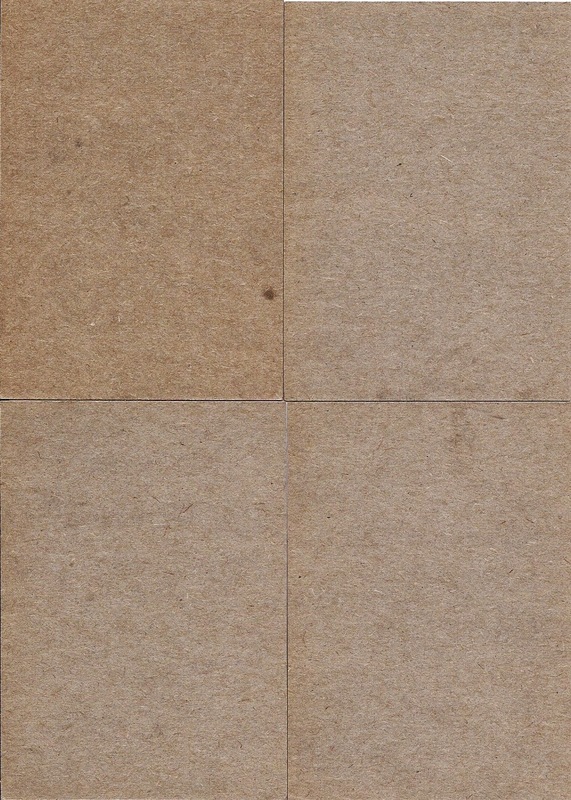 And if you want to pay some bucks, go on the Topps Vault site and there are blank backs that want your money. 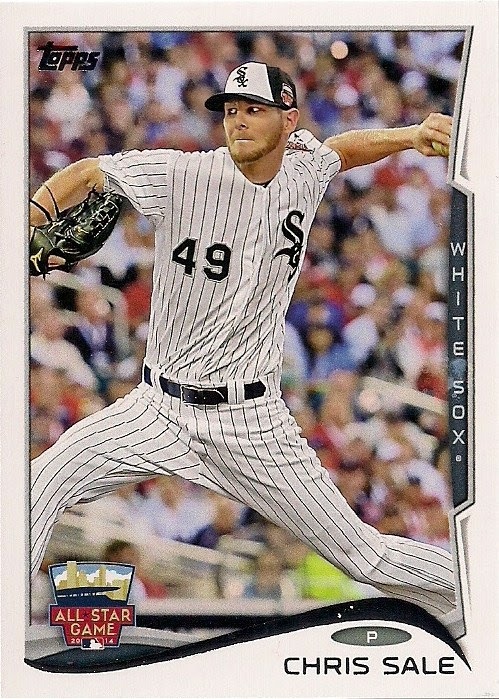 But I was able to find a handful of blank backs through a recent quick trade with Nolan. Looks like three Dodgers and an ex-Dodger from 1977 doesn't it? 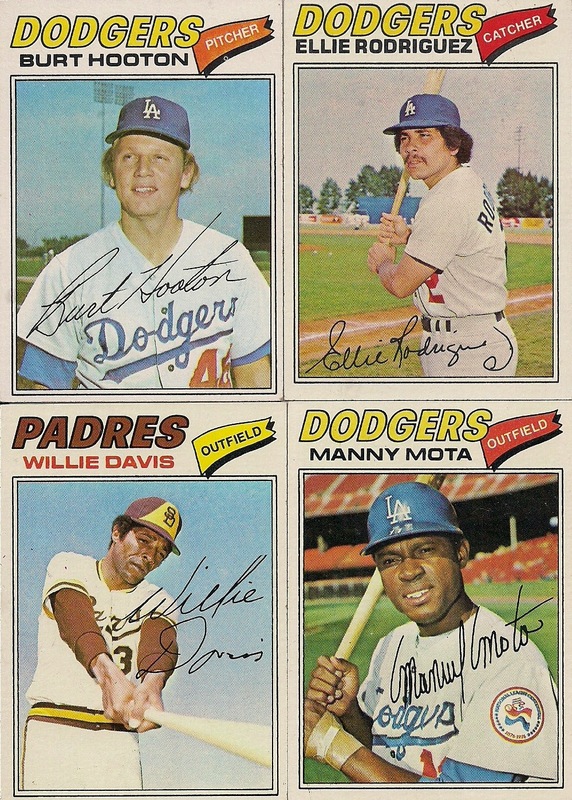 It's three blank-backed Dodgers and an ex-Dodger from 1977! 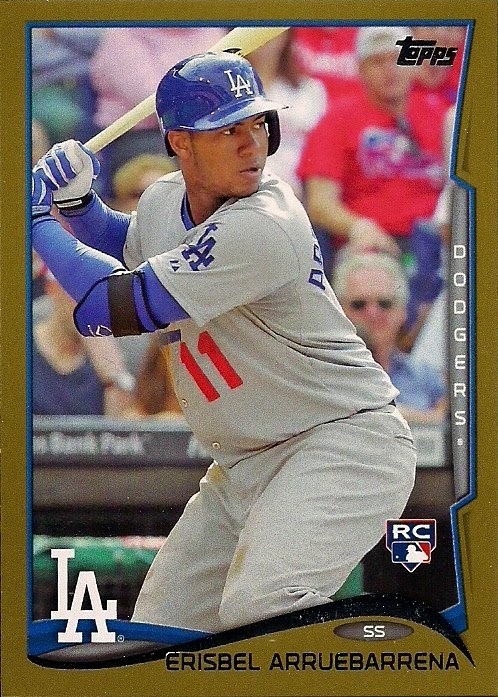 Pretty cool and especially cool since the Rodriguez card was the first Dodger card I pulled back in 1977. Nolan said he received a bunch of blank backs from an Ebay seller a while back. Probably until I got these I thought of blank backs in packs as an '80s phenomenon. But I guess not. This is one of those variations that I have no desire to chase. But it's a fun little complement to my Dodger collection. And, yeah, still looking for a regular-backed Tom Nieto. (OK, now for those of you who came here because you thought this post was going to be about Taylor Swift going psychotic, here you go. The only kind of drama around here is cardboard drama). 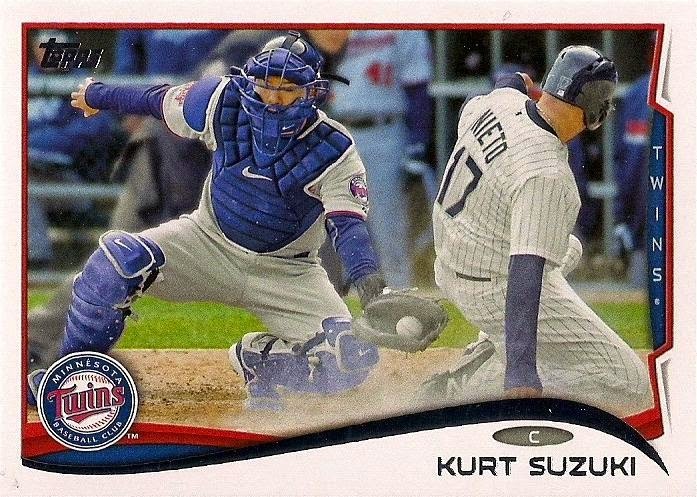 This is a pack of baseball cards. We go out of our way to eliminate mystery from our lives. Think about it. Those of you who are old enough probably remember when radio was the only option. If there was a song you really liked, you either saved up enough money to buy the record or you waited until you heard it on the radio. But you could wait a reeaaaallllly long time. Through a whole bunch of songs you didn't want to hear. And through commercials, too. But when the song finally arrived -- days later sometimes -- it was glorious. There was mystery. You had no idea when you would hear it again. Today, we simply download the song online or use whatever device we have to skip past everything we don't want in order to get to what we do want. We do the same with cards. A lot of us are all about the singles and the guys in our collection. So we dispense with pack purchasing and box busting to buy exactly what we want for exactly the price we want. It's very efficient. We are very, very efficient people these days. Much more efficient than 20, 30, 40 years ago. But in the quest for efficiency sometimes we eliminate mystery. I know, I know. "Mystery" is an antiquated notion to some people. It's romanticism. It's not very realistic or practical. You can't quantify "mystery" with a formula or rate it or turn it into a percentage. Yet, there are people -- people like me -- who keep coming back ... to mystery. 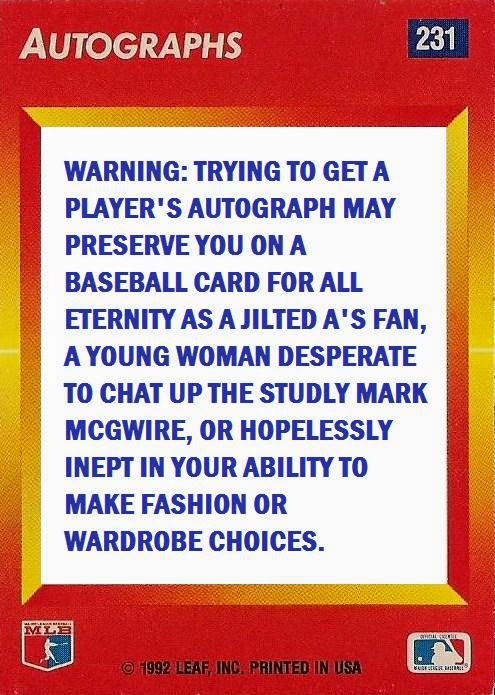 That's why the baseball card shelves feature cards enclosed in packs or in boxes. Mystery, or in this case "enticement", is how they win the sale. And for those of us who still like a little mystery in our lives, we're suckers for a wrapped pack. So I bought one of them today, to live out a little mystery. 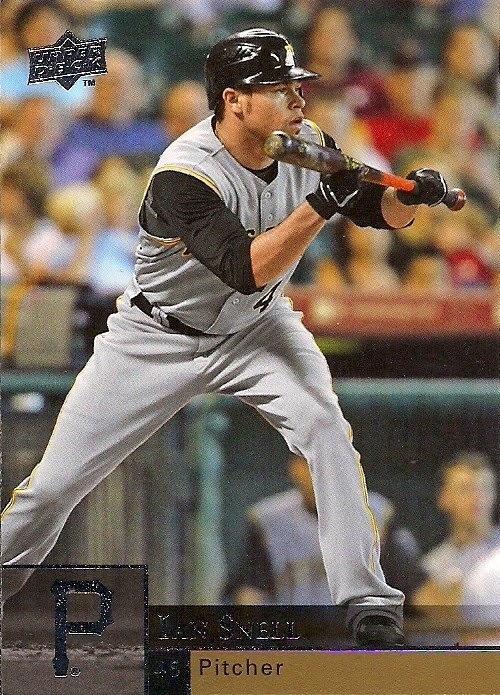 Sure I know what 2014 Topps Update is all about. I've purchased it and seen it and written about the cards. But I haven't bought a pack of it in this form -- a loose pack. I haven't bought this pack before. It's new. It's unknown. It's mystery. 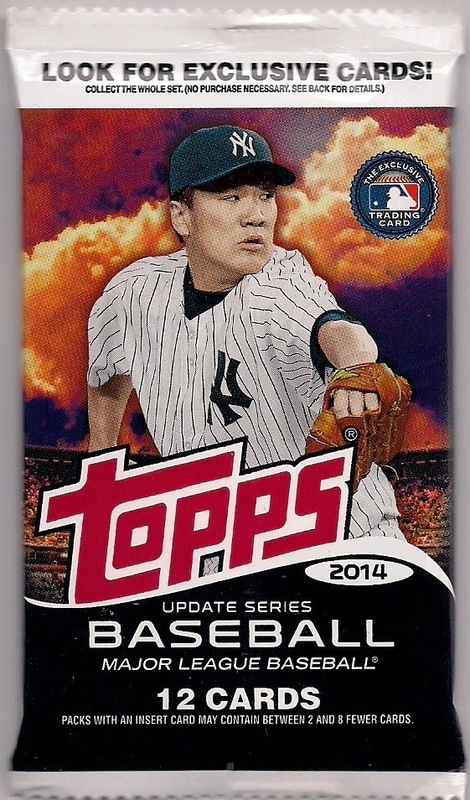 I'm going to open this pack, featuring the blood red clouds floating behind Masahiro Tanaka, right now while the mystery still exists. No time to digest the pack. No opening it and then running errands for four hours. I'll open it and give my immediate thoughts as each card unveils itself to me. I'm showing the last card first because I accidentally spotted it as I was opening the pack and mystery is very key here. Immediate thought: I don't like seeing people swing a bat when they aren't wearing a cap. I can't help it. I won't apologize for it. I don't like it. Immediate thought: Crap, a Yankee. It's going to be one of those packs. Immediate thought: 4 does not go into 15. 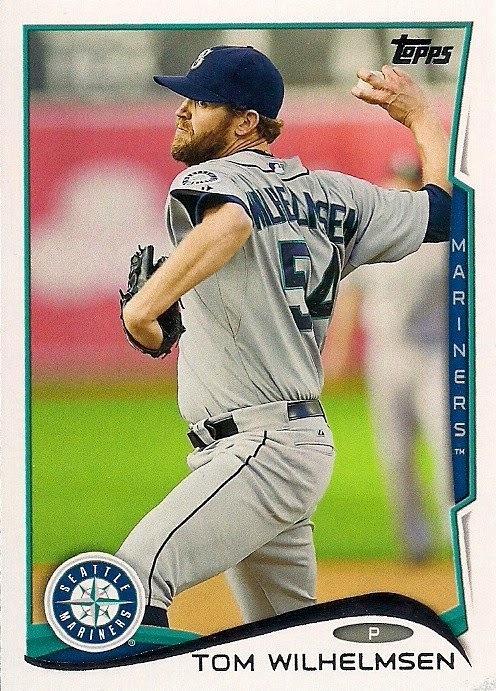 Immediate thought: I cannot trade Mariners cards to anyone. 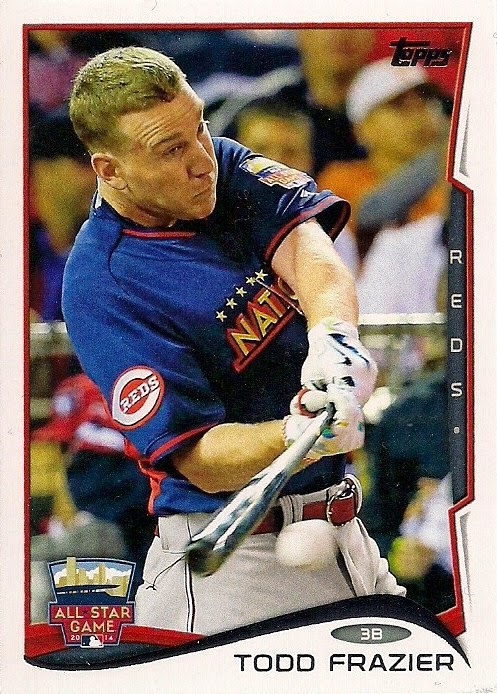 That has to be the record for the most "did not play"s to appear on a baseball card. Also, where is 2009? Immediate thought: (*while scanning*) Ack! I spotted red on the back of the card! I hope it's not a Cardinal! 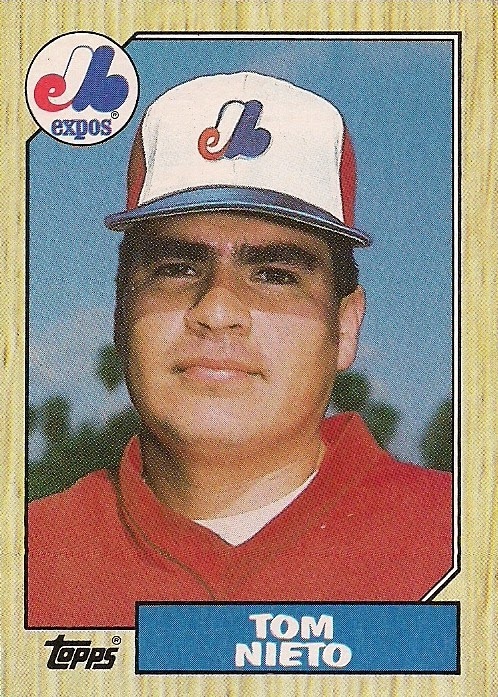 By the way, 1989-95 was a dark period in major league baseball -- not one Cruz was playing. 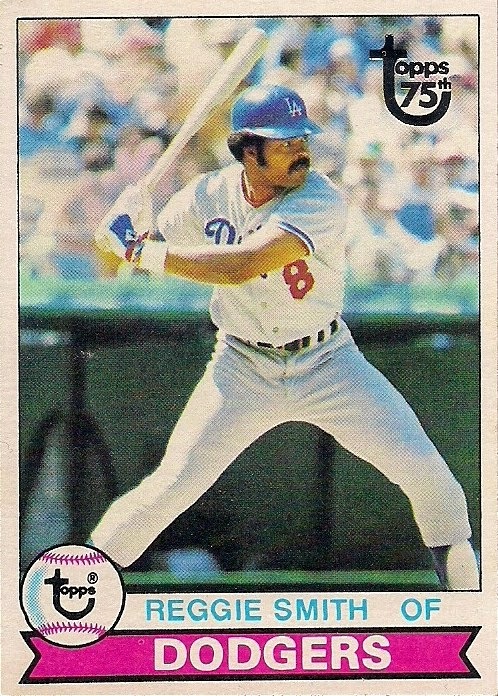 Other than that period, since 1973 there has been at least one Cruz in the majors. Immediate thought: I have this card already. No mystery here. 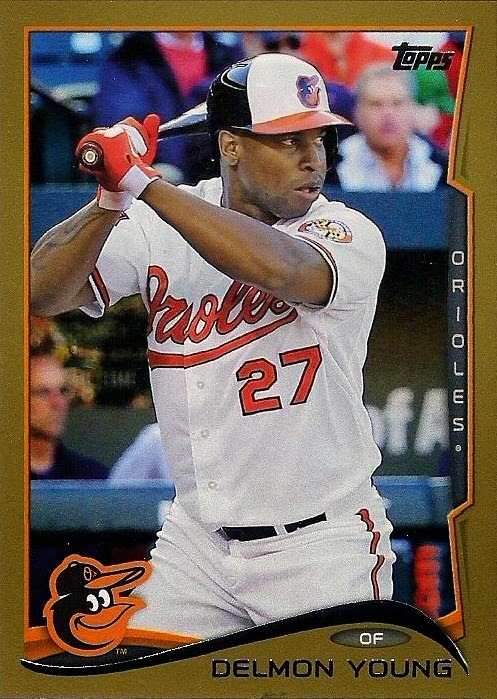 Immediate thought: Great, I just traded with an Orioles collector. 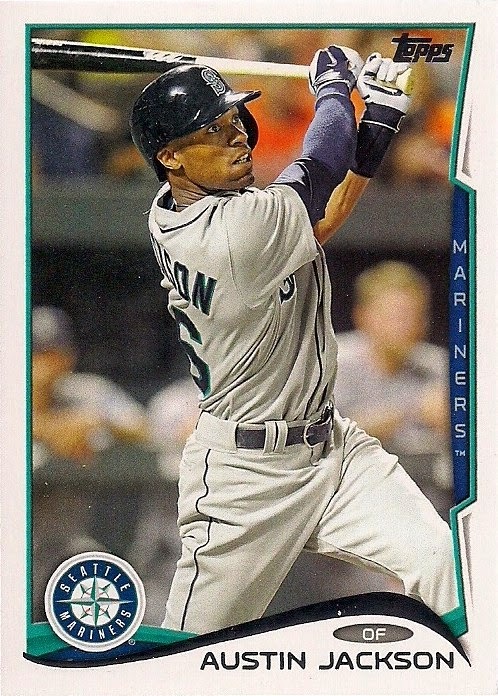 Immediate thought: The same thing I always think when I pull a horizontal card: I wish just one year Topps would make its entire flagship set horizontal. Sure it would irk some collectors. But they're going to be irked anyway. I mean look at that thing! I'd buy that set. Immediate thought: See? Come on, man, that's a cool shot! Horizontal the whole thing! Immediate thought: "The all-star cards are here, the pack is over." But actually that's a decent card. 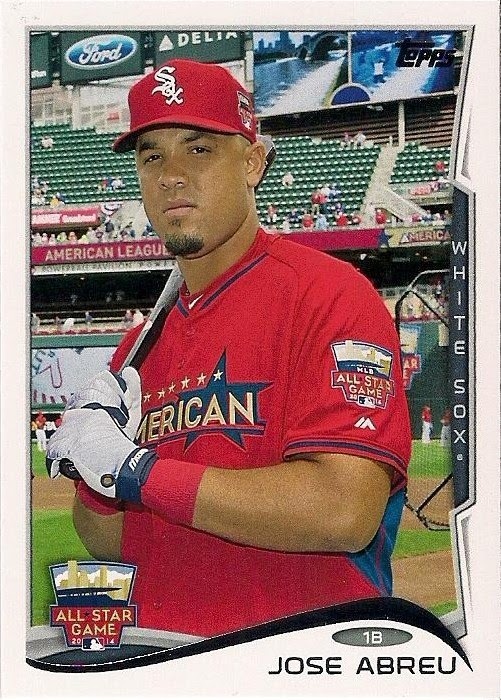 Too bad the Ford logo is battling for prominence with Abreu's red White Sox cap. Immediate thought: "Dear god, those caps." And just like that, the mystery is over. Mystery is fleeting. You hear the song, finally. And you replace mystery with discovery, knowledge, familiarity. All good traits in their own right. Until you need a little mystery in your life again. And that's when those packs in the card aisle will start looking good to you. What's that you got on your head?